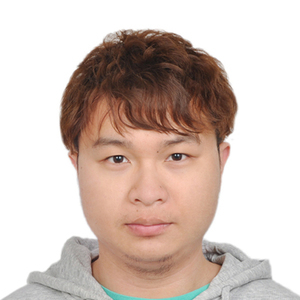 The story started more than 3 years ago, when I was a PhD student at Peking University. At that time, I did some work on the period–luminosity relation of classical Cepheid variable stars in the infrared window. Cepheids are primary distance indicators, which make up the astronomical distance ladder from the Local Group of galaxies to cosmological distances. They are irreplaceable because of both their very high luminosities and their exquisite distance accuracy. However, few Cepheids were known in our Milky Way, since our knowledge of them was limited by the heavy extinction and stellar crowding in the Galactic plane. Searching for Milky Way Cepheids in infrared windows and using them to study the Galactic disk’s structure is an active field of research. At the time of my earlier study, Cepheids associated with the Galactic Center and in the disk’s outer flare had been detected, and several Cepheids associated with the spiral arms were also investigated. Nevertheless, the number of known Cepheids was still only around 1,000 and they covered less than 5% of the disk region. So, I got the idea to search for new Cepheids on large scales across our Milky Way as a whole. An opportunity arose in April 2018 when the Wide-Field Infrared Survey Explorer (WISE) released its fifth year’s photometric catalog, which made it possible to search for periodic variables with periods as long as 10 days. Based on the WISE five-year data, my collaborators and I published an infrared periodic variable catalog containing more than 34,000 new variables – the catalog included 1,312 possible Cepheids. I soon realized its power for studies of the structure of the Milky Way’s disk, and so I collected all known Cepheids in order to trace the Galaxy’s spiral arms. However, my sample pf Cepheids did not obviously agree with the structure of the spiral arms traced by molecular clouds (see Figure 1c). Fortunately, however, I noticed a clear trend in the Cepheid distribution at different heights above and below the Milky Way’s plane. This implied that the Galactic disk is not simply a thin plane. A projection of these Cepheids onto the YZ plane (see Figure 1a) showed an obviously warped disk (see Figure 1b). Figure 1: a: Three-dimensional map of the Milky Way’s disk traced by Cepheids. b, c: Projections onto the Yz (b) and XY (c) planes. The black upward-pointing triangle is the position of the Sun, and the black solid line denotes the mean LON. An intuitive 3D map of Milky Way’s disk was established based on the distribution of 1,339 Cepheids (see Figure 1a). My collaborators Licai Deng and Richard de Grijs were all excited when they first saw the morphology of the Cepheid disk. 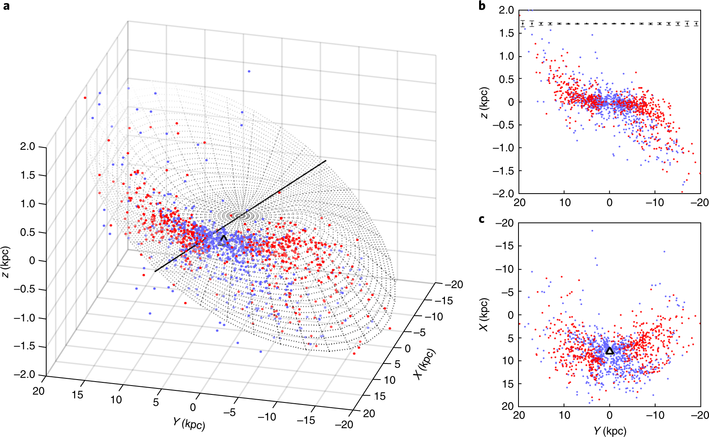 To ensure the highest possible accuracy of the results, contamination such as that caused by eclipsing binary systems and Type II Cepheids were excluded with the aid of Gaia DR2 parallaxes, and a distance accuracy cut of 5% was adopted. The warped and flared structure of the gas and Cepheid disks agree well with each other in terms of their amplitudes. More interestingly, the global line of nodes (LON, it denotes a line that joins the ascending node and the descending node of an orbit) of warp surely deviates from the Galactic Center–Sun direction. Based on these accurate distances, my collaborator Chao Liu proposed that we might detect the warp’s precession. Indeed, the warp’s LON angle is changing with Galactocentric radius in both the spatial and kinematic maps (Figure 2). A clear increase of the LON is apparent at 12 ≤ R ≤ 15 kpc, advancing in the Milky Way’s rotation direction. This leading spiral pattern warp validates the notion that the origin of the outer disks pattern is predominantly induced by torques associated with the massive inner disk. At even greater distances, R = 15.5 kpc, the LON appears to twist. In addition, within R = 12 kpc, the LON angles decrease with radius. These features support the idea that our Milky Way’s warp follows the rule established for other spiral galaxies (Briggs’ rule). Figure 2: The precession of Milky Way’s warp. This new morphology provides a crucial updated map for studies of our galaxy’s stellar motions and the origins of the Milky Way’s disk. In the future, we would like to use a more complete Cepheid sample including objects found at Galactocentric radii R > 15 kpc and behind the Galactic Center, which could reveal an even more accurate and detailed disk structure. Also, other tracers such as stars of certain spectral types or open clusters are expected to trace the evolutionary behavior of our Milky Way’s warp.